Steve Harvey memes may be old, but I’ll never get tired of them. I really hadn’t expected Trevor Siemian to play that well. The one interception was a bad decision, but honestly I think Booker’s fumble was more painful. Jay Cutler used to choke constantly in the red zone with the Broncos, but I didn’t have the same feeling here. I know the word ‘poise’ is overused, but he wasn’t rattled and just kept going. Oh, and that little sidearm pass he had to start the game was nifty. Yes, the refs should have called a couple of those helmet to helmet hits, but they also should have called holding on Von a number of times. Also, I would like an explanation why Cam wasn’t held out a play on that last really nasty hit. He was down and rolling on the ground and in obvious pain, and I thought that was an NFL rule. They would have been fine with Derek Anderson for one play, they’ve done it before. Today’s early games in my area are a division match between the Chargers and Chiefs at Arrowhead and Bears at Texans. I doubt the Texans will have much trouble against the Bears unless the Bears’ D gets good pressure on Osweiler and sacks him a few times. He holds onto the ball way too long; it’ll drive Texans fans nuts. Somehow I don’t think that’ll happen today, though. I hope the Texans’ O-line is good, they’ll need it. As for the other game, I have a weird feeling that the Chargers will upset the Chiefs. My rational side can’t quite get there, though. We only get one late game on Fox, which is of course the Giants at the Cowboys, and then the NBC Sunday Night game with the Pats at the Cards. Here’s the thing: I hear every talking head and fan out there writing off the Cowboys and Patriots as having no chance. 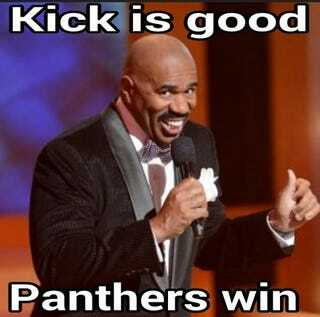 That’s what I heard all week about the Broncos facing the Panthers. I believe it a bit more with the Pats now since Gronk isn’t going to play, but I’m pretty sure the rest of the team is going to make the flight and I’m not saying they have no chance. I mean, I want the Cards to win so the Broncos have a leg up on New England, but the Cardinals looked pretty blah in the preseason and it wouldn’t surprise me if they lost. And the Giants will be in the same position the Panthers were, going on the road against a QB who hasn’t played an NFL snap and there’s no film on him. I want the Giants to win, but same thing. I won’t be shocked if they don’t. Monday’s games are Steelers at Redskins (I feel like that’s a weird matchup), and the Cleveland Los Angeles St. Louis Los Angeles again Rams at the Niners. I don’t know that I care much about either game and I don’t have cable, so I might listen to them on the radio. How did your team shape up in the preseason, and how do you think they’ll fare today?